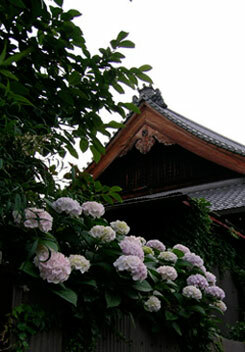 June is the month of Ajisai and their blooms just fill the city everywhere. 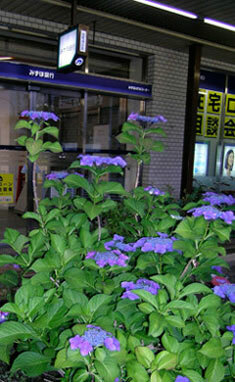 My grandmother called them “hydrangea”, but that name never seemed to capture their elegance or soft femininity. So I tend to use their Japanese name ajisai (aah-gee-sigh), a softer sound that invokes the warm sighs of a languid summer day. I love the deep purples, rich blues and cherry pinks, the big round pompoms and the disk-like shapes that flower only at the edges. On a June day the flowers are everywhere — they light my path as I bike around the city. Tall bushes spill their blooms over temple walls. Small bushes of cherry pink that sit at my neighbor’s door step or poke through the chain link fence at the school playground. Beauty blooms on the street corner in front of the bank and along the edges of the canal by Philosopher’s Path, giving delight to all those passing whether they stop for momentary enjoyment or just savor a quick glance while continuing on their run. Cherry blossom time may have world-wide fame, but in truth, Kyoto is a city in love with its flowers throughout the whole year round. This entry was posted in Kyoto living on June 16, 2008 by admin.